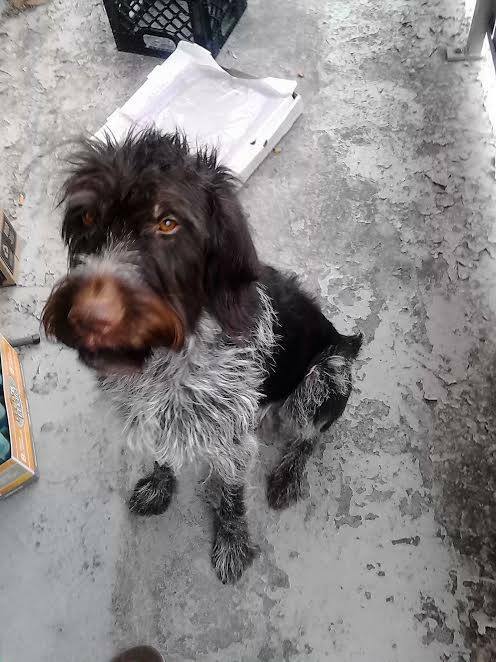 JAKE 3 YEAR OLD MALE GERMAN WIREHAIRED POINTER--ADOPTED! Health: Healthy. Jake has just been neutered and microchipped. He is up to date on vetting and in great health. He has had on going ear issues which they treated with Aluminum Acetate drops weekly. He was fed both Raw and Holistic Kibble. Training: Jake is crate trained, but doesn't enjoy when his people leave and does some howling/barking. He needs some training and would benefit in an obedience course. He is friendly, smart, trainable, obedient, high energy, enthusiastic, and eager to please. He loves swimming, car rides, walks, other dogs and being with his people. His exuberance is too much for toddlers. Jake seems cool about all things city so I think he’d fair fine in either environment. Even before the neuter he’s pretty cool with other dogs, and people. His leash walking and recall need a lot of work to function best in the city/city dog parks. Jake is super smart. In the house – he will do a sit stay while I leave the room, walk around him and open and close the door. He is super food motivated (kibble will do). I expect that he might be very good at Rally or Scenting work – maybe even Agility. It would be great if his forever guardian was interested in doing some work with him. Jake does seem to like kids. That said he’s a rambunctious almost 3 year old who gets over excited and makes bad choices. Unattended he could easily hurt a small child with his enthusiasm. Jake does like to snuggle and be touched. He can get a little demanding if you stop petting before he is ready. He will paw, jump up, and even grab an arm with his mouth. It can be pretty scary for the uninitiated and certainly children. He needs to learn his manners. Jake howls when we leave the house, and barks in play or if being crated without a distraction. He also barks at door knocks, and surprise sounds – he’s a pretty good guard dog. He needs to be in a detached house where a vocal dog will be tolerated. I wouldn’t call him a yappy dog – but his bark is loud. When he is initially crated or if he is being left behind and the door is closing he has this manic anxious bark that is pretty unnerving. It doesn’t last long, but it’s heartbreaking. I’d hope his new owners were mostly around or able to take him with. I think he will fall apart in a 2 working person home. Jake is pretty good in the car. He does whine a little, but eventually settles. Jake will do fine with other dog/dogs. His guarding of bones/toys/food needs to be addressed. We have been working on it, but there are lots of setbacks. Jake works best with positive reinforcement aka food.